I’ve woken up to this situation five out of the past seven days. On the other two, there was water but no power- a more preferable combination. Kigali, as I can best I can deduce from Facebook posts and informal conversations, is struggling to serve its continually growing population, resulting in shortages of essentials. Three weeks in, and my routine has grown around these shortages. Wake up, check the water, check the power. In the case of neither, prepare coffee with water from a jug and boil it on the gas stove. Substitute a real face wash for a disposable wipe. Pack for the day, leave the house, catch a bus. Save basic necessities for the workplace. Even though I’ve lived in Rwanda for nearly a year, with a two-month hiatus back home for the summer, life in Kigali is an adjustment back to African reality. I no longer walk everywhere; instead, I take two buses to get to the U.S. Embassy, first flagging down a small matatu bus on the road outside of my house. Each morning, en route to work, I shoehorn myself into the already crowded hull which has been stripped to its bones to accommodate custom benches welded to the body, allowing four rows of seats, four on each bench, and an extra two in the front. Twenty people in total. One man crushes the accelerator and coaxes the engine to life while another calls out the window and collects the fares, which you pay upon exit. I press 200 francs into his hand when we arrive at the Kimironko bus depot, where I tend to be the only white person. The station is a hub for transport moving all around the city, a nerve center with uneven cobblestones and no signs. Everyone seems to know where to go, and now I’ve learned, so I know as well. 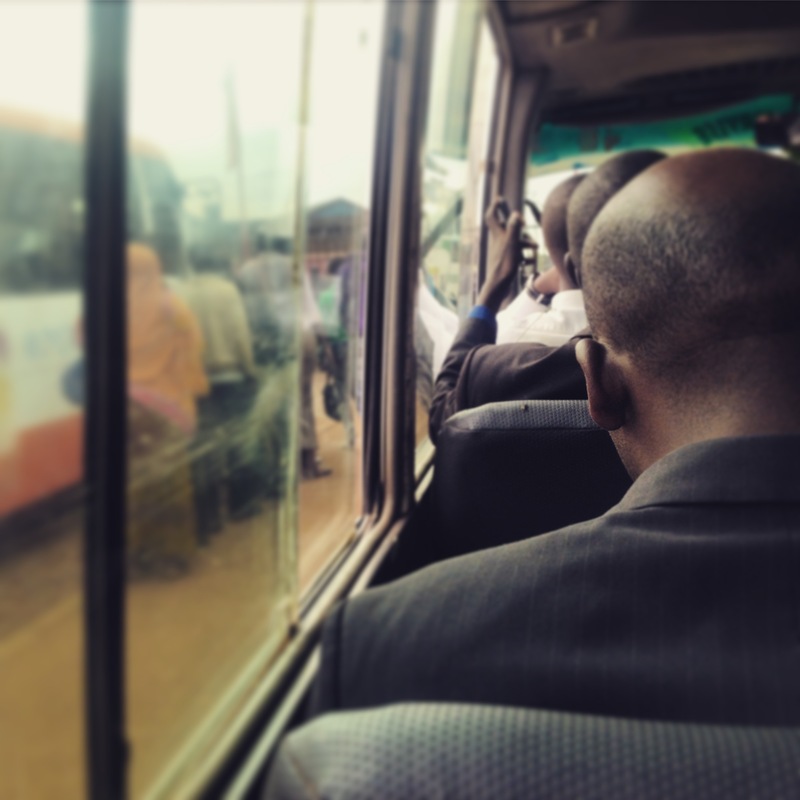 Another bus: the 305 to Nyambugogo. A bigger one- a white Coaster with four seats in a row, the middle seat a fold-down contraption that requires the passenger to move each time someone further back in the bus needs to get off. You don’t want the middle seat. It requires constant moving, shifting and looking for a more permanent position for the ride. The bus lurches to each marked stop as passengers signal the driver by clicking coins against the bus windows, and eager new passengers often clot the open row as you try to get out. It’s a microcosm Rwanda: people, everywhere, my American space bubble constantly on hiatus. I clamber out at the Kacyiru bus stop, located at the bottom of one of Kigali’s many hills. Buses pull in, men hanging halfway out calling the name of their final destination, attempting to wave you onto his bus and not his competitor’s. Several bus shelters are plastered with advertisements for cement and Tusker beer, but you rarely need one- buses circle in and out in what feels like a constant motion. From the bus stop, I trudge up the hill, on a path that cuts between the Ministry of Immigration and the Ministry of Education, spitting me out on the main road often nicknamed “Embassy Road” for its line of diplomatic buildings. At one end, situated on a roundabout, is the American Embassy: a hulking, grey brick of a building skirted by a tall, metal-bar fence. I arrive a few minutes later to the consular entrance security building, ragged breathing from my short hill climb, coated in a sheen of red dust from open bus windows and trekking across station yards. For every day I work, I cross a border: from my Rwandan life, sardined into buses, weaving between vegetable stalls at the market, crossing my fingers that turning the tap in the morning will produce water and not sputtering, empty pipes. Here, I enter through the consular entrance, my yellow security badge acting as my passport. This badge means that I can skip the line of Rwandans and non-badged Americans leaving all of their electronic earthly belongings with the security desk. I can blaze through the metal detector, no one caring if it blares as it reads my laptop and phone and flash drives, while others go back through their pockets and backpacks to find offending devices to forfeit in the process of this modern strip search. Today, my schedule is light with only a meeting at 3:00pm, so my first stop is the pool, settled in the back of the compound near the Marine residence with a view of Kigali’s glass-and-steel downtown sector. 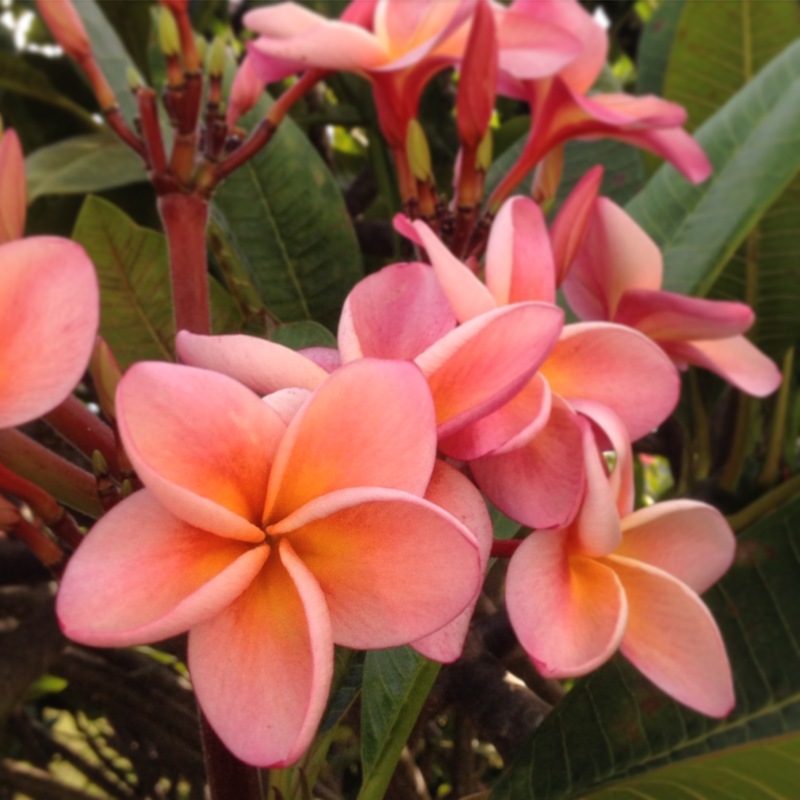 The path edges past a line of plumeria shrubs, their deep, warming scent channeling Hawaii. The pool is bright blue, reflecting the Kigali sky. It’s usually empty at mid-day, so I can swim laps and take a hot shower in quiet with only the sounds of the city in the background. Inside the Embassy building, I beeline for the water fountain to fill my canteen. I’m not the only one, but my water-oriented behavior is more common with Rwandans than the Foreign Service Officers who staff our nation’s international outposts. I see the local staff come in, like me, with canteens and small water jugs to fill. Sometimes, the power drops. A few beeps and the flights flicker out, giving a few seconds of darkness before resuscitated by a few more beeps and the buzz of fluorescent tubes coming back to life. The generators which provide the power are somewhere on the embassy compound, but never something that you hear. The power blinks off, and then back on, as if by magic. Life, and the operations that make it possible, continue on. My work hasn’t changed so much from the last year: while I answer to Americans, I liase with Rwandans. They populated my classes; we partner for workshops and conferences. At present, I’m waiting for the space where I will teach and lead programs to be completed, so my classes take place in the Embassy library and I meet with colleagues and supervisors in the compound’s conference rooms, when needed. It’s become a slow transition back to my life in Rwanda after a summer in California- a foot over each side of the border, never all the way in Rwanda, never all the way home. But I can’t say that I don’t enjoy it, the novelty of a few hours of a very American existence while still living in a developing country: working in air conditioning, the stopgap of Embassy showers and water fountains, a cafeteria that serves tomato basil soup and Coke Zero. Last year in Musanze demonstrated to me how so much of my productivity in the States is based on a life ruled by convenience. The convenience of a shower that gets hot in seconds, having a car to get between jobs, power that never goes out, a dishwasher, a clothes washer. Last year, elbow-deep in wash water, I could see how that machine not only made my clothes clean but freed up my energy and creativity. Does indulging in these apparent luxuries actually make me more effective for my work outside of this lead-lined box? Is that the notion behind well-paid NGO CEOs and the comparatively more comfortable life of the Foreign Service Officers? Lunch was simple: a bowl of tomato basil and a small cinnamon roll, but saved me the time of cooking between my 45-minute bus and foot commute and eliminated much of the risk of food borne illness, a panic developed after multiple issues last year. A small light. Despite my reverie and in the midst of my existential crisis, my security badge swings forward and baptizes itself in my soup, swinging back toward my abdomen and raining holy soup water down the front of my dress. Bruised knees and a right elbow gash bear witness to my recent disagreement with a dirt road. My hair is still wet from a post-swim shower and pulled in a low bun over the collar of my dress. An attractive man with careful blonde hair and polished wingtips passes my table. A woman, dressed smartly in a wool blend sheath dress and stiletto pumps, removes her lunch from the microwave. All around, a dearth of wrinkles and a sea of dry-clean only. Somehow, I don’t quite fit in either place, so I continue straddling the border, exiting one side when I become exhausted with either place. Crossing, five days a week.